It is only few months ago that I learned how important it is to exfoliate the skin on our face. I do exfoliate the skin on my body, yes. But on my face? I’ve honestly never done it before because I thought the skin on the face is too delicate for such thing. Apparently, removing those dead skin cells can even help prevent spots, pigmentation, pimples, blackheads, dry and oily skin, wrinkles or dull skin. If you’re thinking (like I did before) that make up remover or facial cleanser can do the job, you hit it wrong. So when Sample Room introduced this product called “Cure Natural Aqua Gel”, I got too curious that I opted to grab a sample. It was said that Cure is Japan’s #1 exfoliator that one bottle is sold every 12 seconds! Wow. Wash your face first with your favorite facial wash then towel it dry very well. Make sure that your skin is really dry as Cure doesn’t work well with wet skin. Pump a dab of gel on your fingertip. Apply it on your face and massage in a circular motion for around 30 to 60 seconds to remove the dead skin cells. Wash your face with water then follow your daily skin care routine. Cure is the gentlest exfoliation for your skin because it is made up of 90% hydrogen water. It is preservative free, coloring free, mineral oil free and artificial fragrance free. 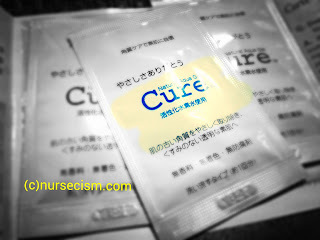 Consistency Rating (out of 5stars): ☆☆☆☆ | When I first tried Cure, it almost spilled off my fingers because the consistency is just slightly thicker than water (runny gel). I guess their claim that the product is made up of 90% water is true. It’s good that they put the full size of this product in a pump type container because if not, a lot of its contents might just be wasted. Smell Rating (out of 5stars): ☆☆☆ | Cure claims that it has no alcohol and that it’s artificial fragrance free. I don’t know if it’s just me or there really is a hint of alcohol in its smell. Other than that, it’s fine. Exfoliation Rating (out of 5stars): ☆☆☆☆ | I really can’t believe at first that those white particles coming off my face were dead skin. I thought it was just the product itself clumping together and fooling me that skin is being exfoliated but I was so wrong! I tried applying Cure on my underarm just to see if there’d be any difference and guess what? No white particles came off! Another good thing is, Cure doesn’t sting the face. It is so gentle that you won’t feel anything unusual even if you apply it on your pimple. After Use Experience Rating (out of 5stars): ☆☆☆☆ | I felt how clean and baby soft my skin was even just after the first use of Cure! It didn’t strip moisture off my face and most of all, it didn’t cause any breakouts! Overall Experience Rating (out of 5stars): ☆☆☆☆ | This product deserves 4 stars. It is so easy to use and it does its job with flying colors. I didn’t give a perfect score to leave a room for improvement in terms of consistency and yeah, the price (1,500php)! Note: Cure only removes 0.01mm of your dead skin and it doesn’t dissolve body protein so there is no possibility that you might remove too much skin cells. But make sure that you don’t overdo rubbing your face or it might get red. Cure can also be used on elbows, knees and even on your cuticles! It is recommended to use twice a week. I only got a few sample pieces of Cure and I already used them all up. I really like to purchase a full sized bottle but it costs too much (1,500php for a 250ml)! Oh well, quality is never cheap, so they say. Have you tried this product before? What other exfoliator with the same quality but cheaper price can you recommend? will try this out. i maybe vain but testing this is worth my money, i guess. thanks for sharing abut this product? where did you get this and how much does it cost? We really need to exfoliate our skin atleast once a week to remove dead skin cells. High price equals high result. Haven't tried this one yet though I can't disagree with you regarding quality never comes cheap. Our son's moisturizer costs almost 1400 php now for only 299ml. It says that the more expensive the product, it is more effective. I will try to use this if it effective. It's nice to see cure focus on dead skin cells and not proteins in the body. Is this product recommended for teenagers. I'm trying the find the best facial products for mine. that looks good indeed just looking at the photo! a must try for all the girls who live in a tropical weahter! I really find it quite expensive.. but yeah, I've read a lot of reviews that it's a great product.. Very nice review. I'll let my wife buy one to try. How much does it cost per pack and is it already available in Mercury drug or Watson's because I want to try it also. This is food for skin rejuvenation. And it is easy to use. No surgery is needed. What exactly is exfoliation? I think I never tried it. Can guys use this product too? I wanna try this, it looks very effective and not harmful to our skin. Love to try this product and see if it works. They said that it is Japan's #1 exfoliator and very effective especially to asian skins (sounds interesting). Interesting ha! I think this is worth a try. I wonder if this is available at Watsons too? I'd love to try this. Need to save up first before buying though. Anyway, thanks for this review! Very helpful for us who's in the market for a good exfoliator.